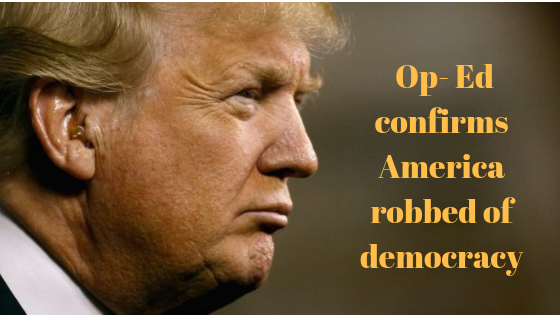 We wrote about the failing democracy of the US and its consequences a year ago – now our concerns are being realised and it is obvious to all. As a result of the NY Times article written on 5 September 2018 entitled “I Am Part of the Resistance Inside the Trump Administration”, Mr Trump now knows there is a significant element of government trying to undermine him and ultimately overthrow his presidency. It is clear that White House officials believe their role is to save America and the world from Mr Trump. But these public servants are robbing the American people of democracy – in order to preserve their jobs! When people vote to install a political leader in a democracy it is expected the leader can and should deliver on their election promises. It is the unwritten agreement between voters and their leadership. When Mr Trump was elected we believe he intended to make good on his election promises but the arms of government have combined together to thwart his leadership. When this happens it makes a mockery of the office of the President of the United States and renders it irrelevant. So what happened to the agreement between the President and the people? As a result of his lack of power, President Trump has become more and more extreme in his actions in an attempt to show his power. The intolerance he has showed minority groups is playing out in suburbia. We have seen the civil disturbances are leading to a lack of internal cohesiveness which will lead to economic weakness. The stoush with North Korea is another attempt by the Presidential office to show external strength to be seen as more powerful. His Tariff wars with the world the same. In retaliation, the arms of government will thwart more and more. Once deposed from office, the arms of government will feel justified in wasting a term of office as the ‘democratic system’ has been protected. The deposed President will be outraged at his inability to seize and use the power available to him. The people who voted for Trump will have been ignored. So too is the fact that they voted for him as they felt the system of democracy was not working. It is an abuse of power by the arms of government who are saying through their actions that democracy does not work. In other words they are agreeing with the people who elected such a leader. But they are actively working against the change that was asked for! The arms of government have said, whilst they acknowledge the need for change in the system, they will block it as it limits their power and position. What we can draw from all of this is a long period of uncertainty and world insecurity. Again the geopolitical machinations bring the winds of change. The average person out there has little hope of keeping up with this, let alone being able to predict the affect upon their investments. Pythagoras is a provider of incorruptible recommendations you can trust. Read more on Pythagoras Investing.